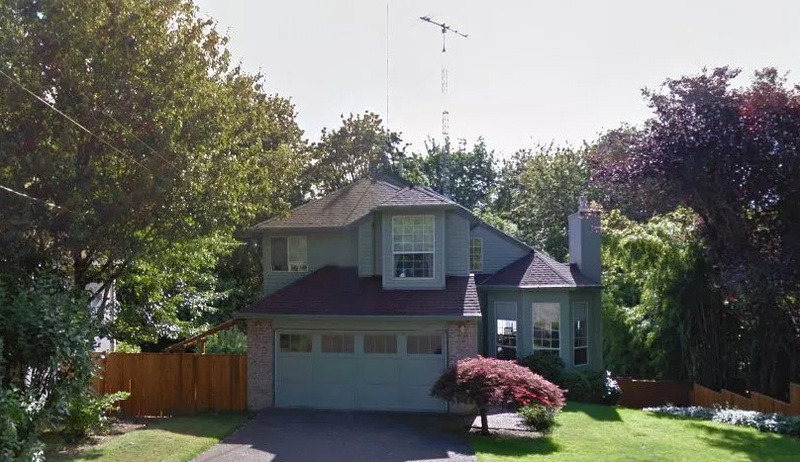 Grid-tied, RFI suppressed, owned (not leased) 6kW net-zero solar-powered home in the heart of Portland, OR – one of the most livable cities in the US. Typical power bill: $12.19/mo. 72′ self-supporting, telescopic, fold-over US tower with motorized winch and gin pole, rigged with a rugged Sommer square-boom XP-507 multi-band beam. Rooftop multi-band Cushcraft 7-band vertical. 132′ inverted vee with apex at 65′. All antennas are electrically switched by an Ameritron RCS4. Available Icom 7410 w/roofing filters, Astron 25W (continuous) PS, SP21 speaker, Autek audio filter. Forced gas furnace w/electrostatic air cleaner. Natural gas fireplace w/multi-stage remote. New higher-end wall-to-wall carpeting downstairs, with hardwood kitchen and entry flooring; builder carpeting upstairs, in good shape. Surround stereo system in family room, integrated with a 51-inch wall-mounted HD TV. 5K generator w/manual transfer switch. 250Mb (current) – or higher Net speed is available. Three security cameras send notifications to a tablet or phone and store video in the cloud. Roof, good until at least 2035, has aluminum gutters with effective leaf screens. Quality dining room table and hutch. Low maintenance landscaping with cyclone-fenced, small back yard. Sheltered Astroturf area for the pooch in wet weather – no muddy paws. Master bath has a soaking tub, stall shower, toilet and two tiled basins. Other upstairs bath has a washlet (bidet), tub and shower. Downstairs utility bath houses a toilet and sink. 3mm beautiful granite counter tops in kitchen and smaller bathrooms. #1 is 11x13 w/single bed, dresser and end table. #2, the master, is 15x18 w/King bed, dresser and two end tables. #3 is the 11x11 shack. Gear is housed in a custom solid wood desk with cubby for a PC tower, drawer with hanging folders, overhead storage and more. Ample lighted space for a desktop PC, large monitor, printer and office supplies. Wired for 220v. Quiet, kid/dog friendly street dead ends at a heavily forested community park with creek, waterfall, playground, picnic tables. Hiking trails snake through southwest Portland, with access to nearby Tryon Creek State Park. Friendly neighbors, good schools, 500 foot elevation, neighborhood has one of the city’s lowest crime rates. Five minutes to I-5 freeway. Fifteen minutes to downtown, three major malls and factory outlet stores. Four minutes to Willamette River, 45-minutes to waterfalls in the famed Columbia River gorge. Less than 90-minutes to the Pacific ocean, Mt. Hood and casinos. About four hours to Seattle, six to British Columbia. Built in 1990, this 1703 sq. ft. home sits on a 10K sq. ft. lot with a small creek in a gorge out back. It is in super clean, move-in ready condition and would be ideal for a young family with up to two children. Truly a rare jewel of a homestead in the inner city. The tower is in back and dwarfed by tall trees. When nested it can hardly be seen. Cash or approved financing $750K sale, complete with major furnishings listed above and appliances, dishes, glassware. Sell what you don’t need. If unfurnished, but for the custom desk in the “shack”, the price is discounted to $725K. No brokers, agents or contingencies, please. Will consider a possible trade for a newer furnished high-rise or comparable single-family fee-simple residence in Hawai’i. No condos.